Ugly scenes after defeat to bottom-of-the-table Stenhousemuir. A youth hanging over the entrance to the tunnel at Airdrie appeared to swear at the officials as they left the pitch following a match against Stenhousemuir. Airdrieonians were defeated 0-1 by bottom-club Stenhousemuir after an early goal in a Scottish League One clash at Excelsior Stadium in North Lanarkshire on Saturday. The home side were denied a late equaliser when centre-back Sean Crighton had a header cleared off the line after 75 minutes. Referee David Munro overruled his assistant who had flagged for a goal. 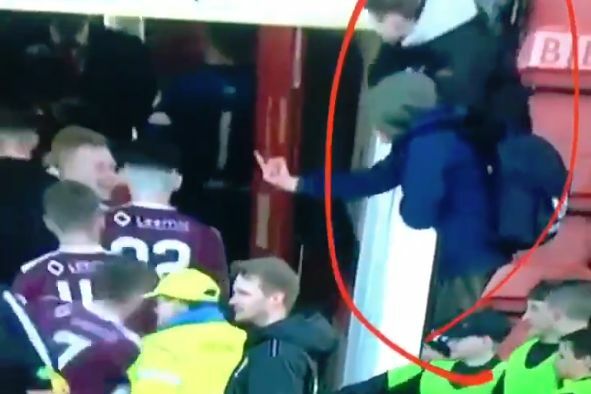 One young Airdrie fan was seen on television coverage of the game taking the opportunity to stick his middle finger up at the officials and perhaps some of the visiting players too.